To sell cars or other vehicles in Virginia, you will need to become licensed at the Virginia Motor Vehicle Dealer Board (MVDB). Luckily, the licensing process for both independent and franchise dealers in the state is very simple and straightforward. Important aspects of the process include passing a test, getting an auto dealer bond, and submitting various application forms. 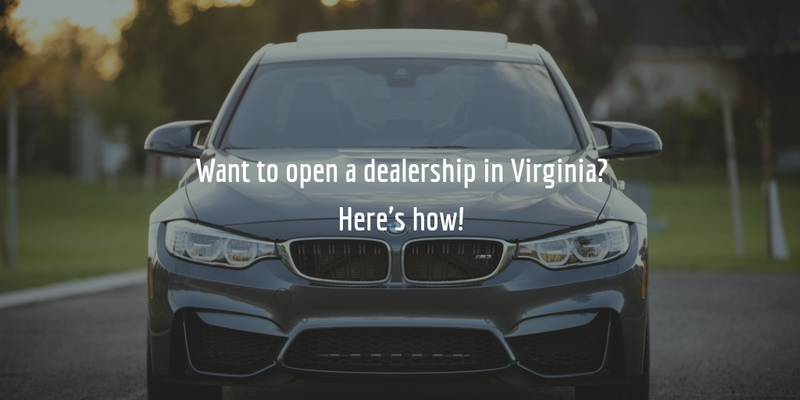 Read on for a full overview of the licensing process for dealers in Virginia. The Virginia MVDB offers two general types of licenses for car dealers in the state – the independent dealer license and the franchise dealer license. The former allows licensees to sell used vehicles, whereas the latter is intended for the sale of new vehicles, obtained from a manufacturer or distributor. Once you determine the type of license and type of vehicles you wish to sell, you can proceed with completing the licensing requirements and submitting your license application. The licensing process for a Virginia dealer license consists of a number of parts. These are: completing pre-licensing requirements such as securing a place of business that meets legal requirements, passing a training course and examination for dealer-operators and salespersons, and completing all relevant forms and submitting them to the MVDB. Before an application can be processed by the MVDB, dealer-operators of independent dealers are required to pass a two-day course of study. Once they have passed the training, independent dealer-operators must pass an examination at the MVDB. Salespersons, as well as dealer-operators of franchised dealers, must also pass an examination in order to be approved, and for the application to be finalized. Upon passing their examination dealer-operators and salespersons must complete and submit their applications forms, as well as criminal background check forms. If you are applying for a one-year license, you will need to pay about $600 in fees, out of which $350 go to the Motor Vehicle Transaction Recovery Fund. After being licensed for three years without having had any claims against the fund or your dealer bond, both the fund fee as well as the bond requirement are removed. If you apply for a two-year license, fees are double. Once you complete your application and submit it to the MVDB, an on-site inspection is conducted to determine whether your place of business meets all the requirements. If all is in order, you can expect to receive your dealer license after that. There is no fixed yearly expiration date for licenses – but renewal applications must be postmarked no later than the last day of the month in which a license expires. Dealers who are late with renewing their license must pay a 50% later renewal fee on top of their regular renewal fee. Those who fail to renew within one month after the expiration date of their license need to apply for a license from scratch. Dealers in Virginia need to obtain a $50,000 auto dealer bond. This bond is required to guarantee that dealers will comply with all the conditions of Title 46.2., Chapter 15 of the Code of Virginia. Its function is to offer financial compensation in cases in which dealers violate those conditions and cause harm or damages to the public or the state. In such cases, claimants can file a complaint with the MVDB which in turn may file a claim against the bond if this is required. The surety may then compensate claimants for as much as the full amount of the bond, whereas the dealer will be required to repay the surety for any compensation which it extends. The cost of the dealer bond, though, is not the same as its amount! The cost of surety bonds typically is a small percentage of the total bond amount. Sureties provide applicants with a certain rate based on their personal credit score, as well as certain other financial indicators. The higher an applicant’s score, the lower their rate is. Rates for these bonds can vary between 0.75% to 3% of the total amount for high credit applicants. To get a precise and entirely free quote on your bond, simply complete our bond application form and we will contact you with further details! If you have any unanswered questions about the bonding requirements in Virginia, call us at 877.514.5146 or contact us by email to request further information!